Many people enjoy the benefits of cinnamon with toast or cereal, do you? Mixed with a good helping of honey, I certainly do. This is one way to appreciate the benefits of cinnamon and the combination is exquisite. It is one of the oldest spices known, mentioned in the Bible and was used in ancient Egypt for medicine, flavouring beverages, and as an embalming agent. It was very highly treasured, so much so that it was considered more precious than Gold!. The dried brown bark of the laurel tree is used to produce both quills (cinnamon sticks) or ground powder. ‘True Cinnamon’ (C. zeylanicum tree) is native to Sri Lanka (formerly Ceylon) and has a more refined flavour. The more common kind (C. cassia tree) and not so highly rated, comes from China. Cinnamon is both anti-clotting and anti-microbial and assists with blood sugar control. It contains both anti-fungal and anti-bacterial properties. These have been found to inhibit the growth of yeast organisms that cause Candida and thrush. It is a very good source of dietary fibre, iron and calcium and an excellent source of the trace mineral manganese. 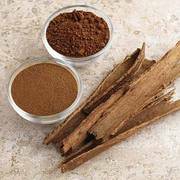 For IBS (irritable bowel syndrome) sufferers, the fibre in cinnamon may also provide relief from constipation or diarrhoea. An accidental discovery, by Richard Anderson, has found that just half a teaspoon of cinnamon a day can significantly reduce blood sugar levels in diabetics. So if you have a high blood sugar level as in type2 diabetes(opens new page), it’s worth serious consideration. An additional benefit is its ability in reducing cholesterol by lowering the ‘bad’ LDL cholesterol. Insulin is a hormone that turns excess sugar into fat. Studies show that a regular intake of cinnamon with a meal produces less insulin, useful when trying to keep weight gain to a minimum. It is so easy to use cinnamon. Buy a small jar from your local supermarket and just sprinkle on toast, morning cereal or cappuchino. Tea drinkers add a cinnamon stick, leave to soak for a few minutes then sit back and enjoy a new refreshing cuppa. Try this as a natural treatment for arthritis. Add half a teaspoon of cinnamon powder to one tablespoon of honey and take every morning before breakfast. Repeat daily for one month, the results should be evident within the first week. A digestion aid for symptoms such as flatulence,indigestion, heartburn and stomach cramps. An aid with sickness, nausea and vomiting. Helping reduce pain caused by arthritis, rheumatism and muscle pain. Being very effective in the prevention of blood clots. Do you use Cinnamon as much as I do? Please share your story/information so others may benefit.